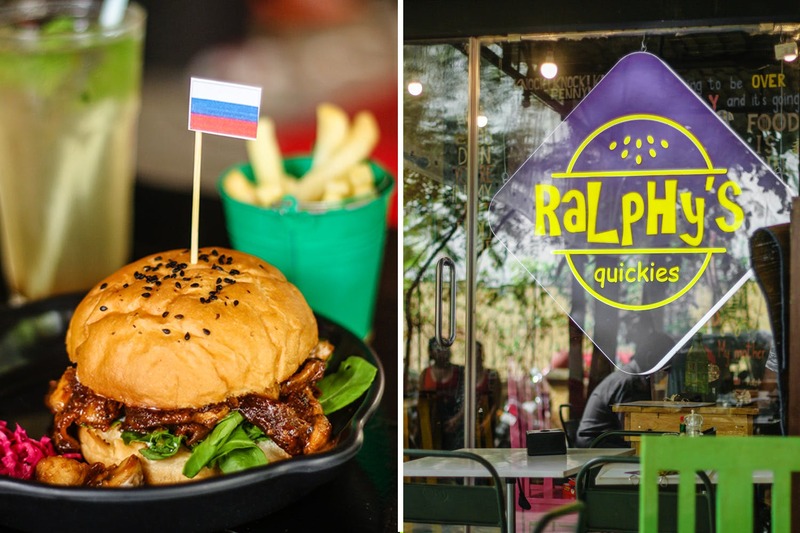 A new burger joint has popped up in the city, with a name that’s as quirky as they come (named after the owner, Ralph). Serving a delectable fare of burgers and other fast food options, the joint is pop culture driven, where the theme is based on quotes and images of popular sitcoms and movies. Already a huge plus with the theme, the eatery has both indoor and outdoor seating and is based in Andheri’s Lokhandwala region. One of their highlights is their menu, quirky in its own fashion, describes exactly what you’re going to be fed, slice by slice. With interesting burgers on offer like The Quickie, The BBC, Baap Ka Maal, Bruce Banner or The Hulk and even The Indian Chick or the MCBC; they have a lot of tasty options with interesting add-ons and house sauces. When it comes to sandwiches, they have the 4Play (feta cheese, nachos, jalapenos, gouda, mozzarella) or even the 3Way (chicken & mayo). They also serve some mean chicken wings, nachos & fries, pork ribs and waffles (sweet & savoury). You can wash down your hearty meal with a choice of shakes or iced tea. To end your meal on a sweet note, you can pick from brownies & ice cream, chocolate cake, red velvet in a jar or even something called the Two Night Stand (waffles, brownies, whipped cream & Nutella). We’ve already salivated enough while writing this piece and are hungry for more. If you’re in for a quick fix meal or just want a place to chill out and enjoy some good food, you know where to head. A Hidden Gem In Andheri With Kickass Burgers To Binge On!